while discussing japanese restaurants with vel at work, she informed me of this one hidden away in far east plaza. strange thing is, i have walked past it millions of times, since it is right at the top of the escalators on the top floor of far east plaza. yet, i have never paid it any attention. they were fully booked but still managed to squeeze a tiny table out in the back room. i noticed they used to serve foie gras but it got struck off - wonder why? maybe they're animal-rights peeps. i should ask them next time. they serve a mixed bowl of vegetables to go with miso paste over here, instead of the standard cabbage leaves. good idea, but some of these were kinda bitter (some kind of chinese melon methinks). i'm happy with just cabbage leaves. piping hot skewers were served very promptly. maybe because it was early for dinner. most skewers were double portions. chicken liver was a little over-done. pieces came quite charred and some were rather tough. quail eggs were a little dry too. 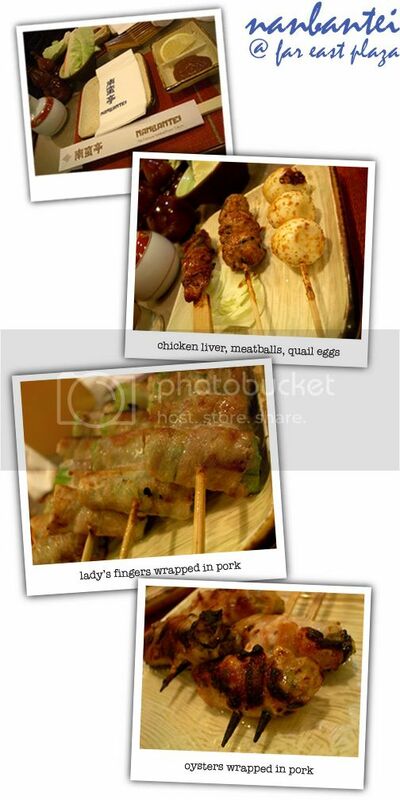 definitely prefer the kazu quail eggs wrapped in pork, which are a lot juicier. lady's fingers in pork were very yummy. pork slices for wrapping were also slightly thicker than those at kazu, but not as thick as shunjuu's. oysters in pork were a let-down. i felt the flavours didn't quite complement each other. bill for 2 came up to about the same total as for kazu and shunjuu, $60+. I wonder if that place is where the old ramen place used to be that many years ago. it's the first thing you see as you come up the escalator! is that where it was? Ah k, then i don't think it is. That place was where that "sate sate" place was, at the stairs? (unless they've renovated the entire place). Sheesh, can't believe I haven't been to Far East Plaza for years. i just went again today! :P girlfriend wanted to catch the GSS before it's over! where is the 1st place for sumiyaki?